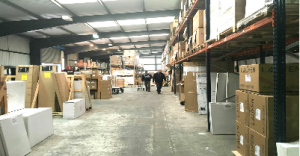 Uptrend Distribution Ltd are based in Exhall, just north of Coventry and handy for the M6 motorway. They have a 35,000 square feet warehouse and the company is 40 years old in 2017. They have always worked with bathroom distribution companies such as Laufen, Vitra and Trojan Baths. In March 2014 Jeremy Bailey took over as Managing Director, together with Lorraine Taylor as Finance Director and Ray Reynolds as Logistic Director. Jeremy has always been forward thinking and feeling dissatisfied with the computer system he had inherited, in August 2014 he ordered a 10 user modern Microsoft SQL system from Sharp-aX Computer Systems of Berkhamsted in Hertfordshire.The installation has gone well and gives Uptrend’s management greater visibility of the business with more instant information that helps the close and warm relationship that they seek to maintain with all their business and staff relationships. They use the NMBS pricing facility allowing individual supplier pricing at branch level which controls pricing for their users. Interestingly all their business documents have been designed and created by Jeremy himself. Currently, as web sales in this country are the biggest in the world, Uptrend are looking at the Sharp-aX integrated web packages that are also enjoying many sales. They carry out their own deliveries and to reduce the amount of retained paper they use the Sharp-aX Proof of Delivery system with scanning and disk storage which cuts the need for paper copies and the effort and time in finding them! Despite the Uptrend longevity, they have never lost money in any period of trading – we congratulate them and are sure of the continuation of their splendid record.